It’s happened. One month in and I’ve used the Roadside Assistance button on my Progressive Auto-Insurance app. Buying a Vanagon that’s older than me was always going to yield breakdowns and stalls. You don’t go into #vanlife thinking that it’s always going to be smooth sailing. I will admit I thought it’d be a little longer before hitting my first hiccup. My sheer force of will and romantic optimism did not separate me from the masses. Allow me to unfurl the tapestry and paint you a picture. In the morning I usually sit in the van and let the engine run as I play around on my iPhone looking for the best music to get me ready for work. It’s only a 2 mile drive so really I am just searching for 2 good songs. The first time I paired my iPhone to the vanagon System of a Down started playing instantly through the speakers. I don’t know how SOAD was selected, or why, but anytime I plug in SOAD starts playing. I have to get something else queued up and start playing it before I turn on the Kenwood speaker. I love System of a Down, but I also love waking up a bit slower than that. I left my complex, hit the main road, and made my way around one of the many Buttes here in Oregon and enjoyed the view of snowcapped mountains in the distance. It’s one of the most stunning landscapes. The mountains were on fire with the rising sun reflecting off the jagged peaks and I settled my gaze on them as I sailed down the open road. On cloudy days I lose perspective on how beautiful and amazing the town is. 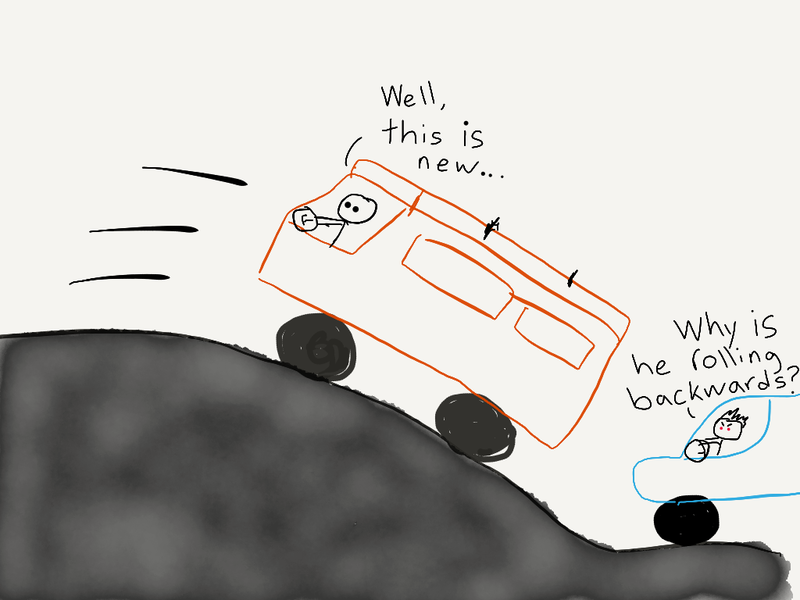 I thought of how silly that was, to lose the childlike awe of nature because of a few clouds, and I vowed to – huh, wait, the gas peddle quit and the van slowed as inertia carried it forward a few more feet before the vehicle came to a stop. I hit the brakes and stared at the dashboard. Three of the four lights on the dash were lit up. I turned the key and listened as the engine tried to come to life but gave up as it sputtered a few muffled sounds of indignation and then fell into silence. Ok then. My first vanagon problem. I’ve read many articles, I’ve watched some YouTube videos – I knew exactly what to do. “Hey the van just died on the road.” I said into my phone. I drove about 10 feet and the van sputtered again and stalled. This time I was at the top of the hill and I was able to roll all the way down the rest of the road to the stoplight. Cars filled up around me as morning traffic for the rat-race started to build. When the light turned green the vanagon did not come back to life. I turned on the hazards and sat there for a few minutes to think about my options. I had not prepared for this scenario, any scenario really, because I didn’t anticipate that I’d face such a problem so soon. 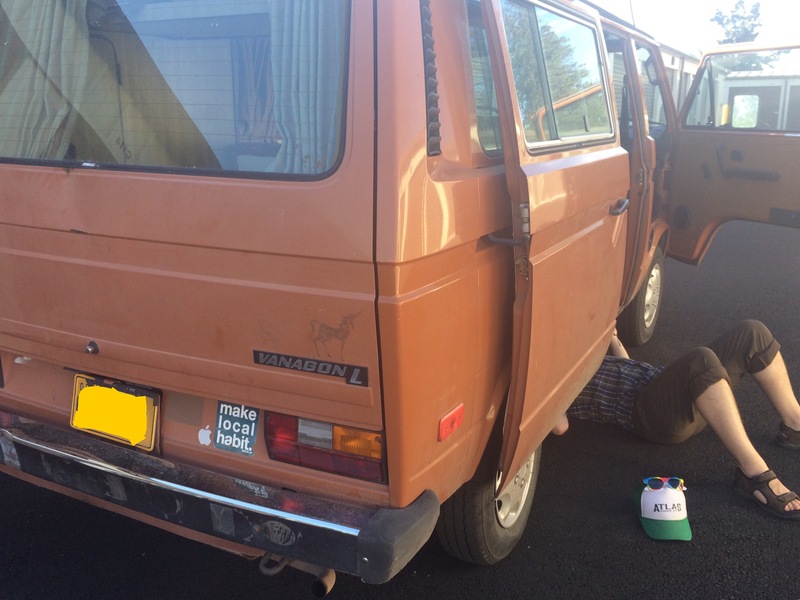 After a few minutes of car honks and aggressive lane changes the vanagon came back to life. I went another 15 feet or so before it stalled out again. I rolled down an underpass and almost all the way up before it started to descend backwards. I pulled the ebrake. JC parked around the corner in her vehicle and came over to assist. She took charge of the steering wheel as I pushed the van from behind. Incase you were wondering vanagons are exceptionally heavy. What struck me most in this moment was that no one came to assist. No cars slowed down. No joggers or dog walkers acknowledged what was happening for more than a few seconds. In a town that prides itself on community I did not feel like I was part of the village. I pushed the van a few feet before I started to lose steam. Finally, a High Schooler walking on the sidewalk ran across the two lanes of traffic and without a word started pushing with me. It’s amazing what one extra pair of hands can do. With his assistance we made quick work of the vehicle and got it properly off the road. We thanked him and he meandered off to school. From there I pulled out my phone and opened my Progressive app and within minutes, just minutes, and a couple screen taps, a tow truck was on its way to my location to take the vanagon to our local Volkswagen mechanic. I didn’t even have to stay with the vehicle. I was close enough to still get to work and by the time I was fully enveloped in the fluorescent light of the office my vehicle was picked up and delivered to Young’s Ole Volkswagen. Now that is what I call service! ← YUCK! Up and Out.